Wayne Poole Racing held another of their exclusive test days at Castle Combe on August 26th. Despite the dire weather predictions the morning sessions were held in blustery but dry conditions. The afternoon, however, was not as pleasant with almost continuous rain making driving conditions difficult. 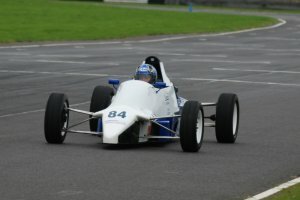 Present at the test were many of the WPR team's usual drivers plus Steve Bundock (pictured left), an aircraft engineer from Lyneham, Wilts having a try out in a Formula Ford after having competed in Moto Cross for many years. Olly Bull put the wet afternoon to good use by searching for the right lines and set up to use at the next race which will hopefully not be soon! Also present were the usual mix of interesting cars from Retro Race plus Luke Cooper and James Harvey from the Cooper and Souley teams.